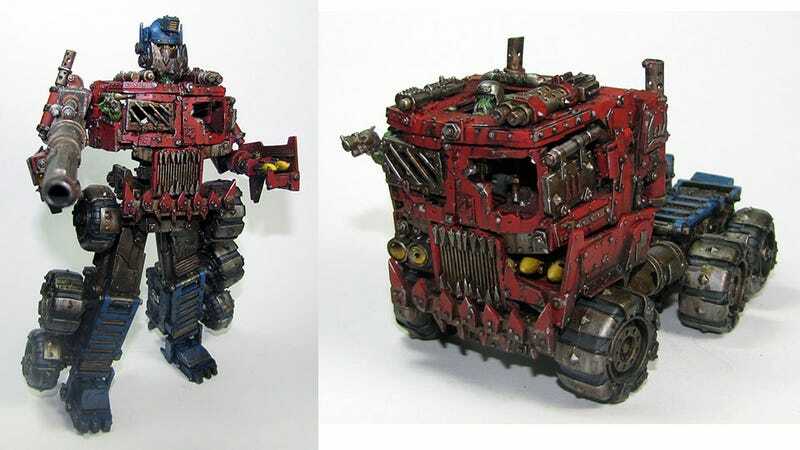 What do you get when you cross Optimus Prime with Warhammer 40K's Orks? A joke with a terrible punchline, I'd wager, but also this amazing custom piece by Singaporean madscuzzy. While it may just look like a slightly modified version of an existing Transformers toy, it's actually the result of a ton of work on madscuzzy's part, in which he took a Warhammer 40K Ork Trukk model, cut it apart, added some joints so it could transform, added some more parts so it looked like a robot, then had to paint it all. A lot of work, then, but a lot of work that was worth it, because this thing is incredible.